It will be a magic moment when this divine bowl of pastel roses is hand-delivered to that someone special. 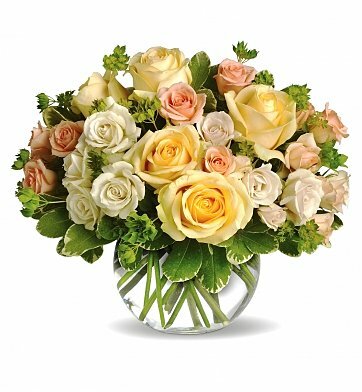 Perfect for any occasion, the soft colors and variety of rose blossoms are a lovely way to send your best. A glass vase beautifully displays a mix of fresh roses and spray roses in romantic colors such as yellow, peach, and white. Sweet and sentimental, the bouquet is the perfect gift for touching the recipient's heart. Light Yellow Roses (40 cm). Arrives in a stylish glass bowl. During checkout, please be sure to indicate your preferred occasion when you choose a gift card. Exact flowers and bowl may vary depending upon location and availability. Magic Moment Rose Bouquet is a hand delivered gift. These gifts are delivered by one of our local design centers located throughout the United States and Canada. Same day delivery is available for most gifts when ordered before the cutoff time. The cutoff time for Magic Moment Rose Bouquet is 10 AM in the recipient's time zone. Rather than use a large national florist I decided to try this company. I'm so glad that I did. The flowers arrived on time and were absolutely beautiful. Couldn't be happier with the product or the service. My wife was overwhelmed with the beauty of the roses she received as a surprise gift for our 45th wedding anniversary. I was very happy with the way it looked and the absolute promptness of the delivery. My daughter was very happy to get this incredible gift. Thank you very much for the wonderful service!